Christmas is one of my favourite times of the year, it's a time where the family come together, where disagreements and falling outs be put behind us, the only time of year that I don't feel bad for indulging in a sea of chocolate, cheese and crackers, the one time where you will sing along to Mariah Carey's smash hit Christmas song 'All I want for Christmas is you' even though you can't hit the high note, and the one time of year where we have a three course meal at home for dinner! 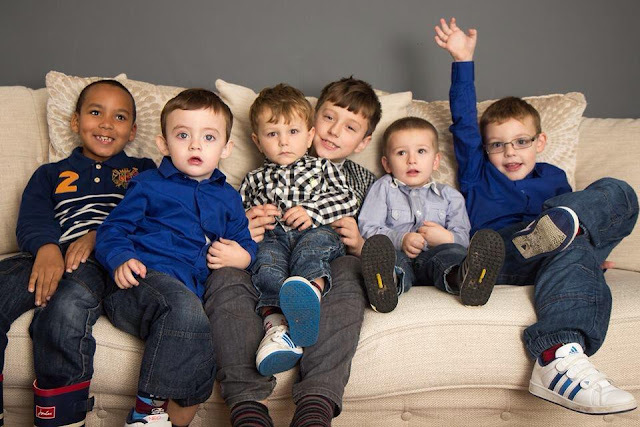 Spud on the left with his five cousins. Christmas is also a favourite time of year for me because it's that time where the camera comes out more than usual, your mouth could be filled with turkey, but you can be sure your dad's hanging around with that camera ready to snap photographs as memories with that Christmas hat on your head. You've got mint sauce around your chops (because if you're like me - mint sauce goes with every roast meat! ), but you don't care, well at least I don't. Take a picture of me any other day of the year when it's unexpected and I'm more than likely going to moan, well I will moan - thats easy for me to say, I'm not photogenic at all, nor do I have much confidence so to me, every photo including me is awful and it's why I don't take many of myself - until it comes to Christmas, then whack them bad boys out, flash and all and take as many photos as you want. This year, knowing how much my dad loves his photo's of his six children and six grandchildren, I've brought him a gift, well two actually that I know he'll love, photobooks filled to the brim with images of his six children (me and my five siblings) and his six grandchildren (Spud and Spud's five cousins). I've of course also got him the socks that he insist is the only thing he needs - year after year for every occasion, that's his birthday, Father's Day and Christmas! There's only so many socks a man can have, I suppose in a way its good as he wouldn't need to buy socks for himself - unless the ones we all get him aren't good enough but Christmas is a special time, and not once have I ever brought my dad just socks. My parents have done so much for me over the years its one of the few times that I feel I can give back, although to us presents aren't as meaningful as presence.